Google’s variant of the Nexus 7 offering HSPA+ 3G data connectivity is back in stock in the UK for the first time since it sold out on launch day, eleven days ago. While the mini-tablet didn’t sell out quite as quickly as the new Nexus 4 phone, which is still to return to stock on the Google Play store, demand was high enough for the mobile data-enabled Nexus 7 to run out of supply shortly after going on sale. It’s now back, with a delivery time of 3-5 business days. Stock problems for the Asus-manufactured Nexus 7 haven’t been as bad as those for the LG-made Nexus 4, which Google is currently not offering anywhere worldwide, although a number of retailers around the world are offering the handset on pre-order with a cellular contract or on pre-pay deals. Still, those keen to get their hands on the most capable version of Google’s acclaimed small tablet will be pleased to see stock levels are replenishing, especially as unlike the WiFi-only versions, the model with a SIM card is currently only available on Google Play. 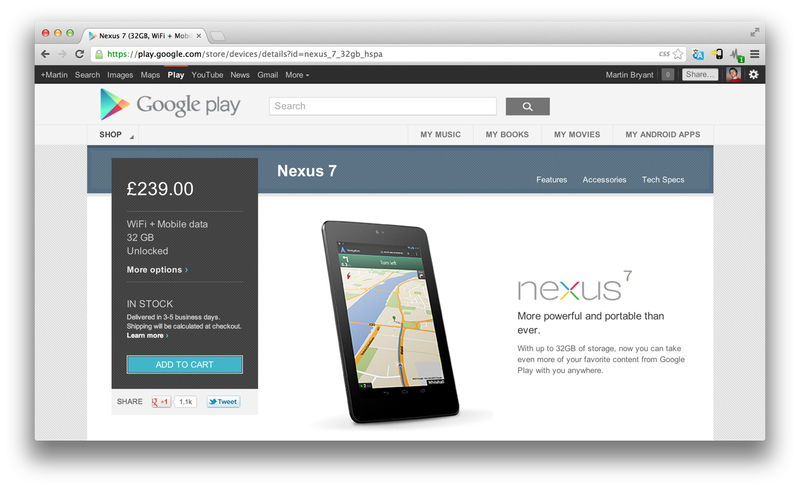 Is the HSPA+ enabled Nexus 7 back in stock in your country too? Let us know in the comments. UPDATE: As of Monday November 26th around 5pm CET, stock had run out again. It seems that demand is still outstripping supply. Read next: Microsoft's big Windows 8 secret? It's actually about advertising.